Daylight works in prisons in England, Scotland and Wales. Our office coordinates the overall development and expansion of Daylight’s work so that an increasing number of prisoners are reached and more ex-offenders are supported as they adjust to life on the outside. Daylight partners with other organisations across the country to enable this development. Daylight’s work is overseen by Regional Directors who coordinate Daylight’s work both inside and outside of prisons across their region. They work in partnership with prison chaplaincies and governors to visit prisons, run chapel services and lead Bible studies. Regional Directors also oversee the work of Daylight’s regional support groups which work in partnership with churches providing practical and spiritual support to ex-offenders after their release. As an offender adjusts to life on the outside and begins to integrate back into the community, these support groups help them access local service providers for housing, employment, health, addiction, education and family support. Through the network of support groups, Daylight’s regional directors can put an offender in touch with a support group in the region to which they are being released, even if it different form where they served their sentence. 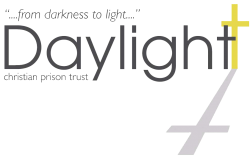 Daylight delivers its support through local volunteer prison visitors who visit prisons near them so that they can build good relationships with prisoners through which they offer essential support. Daylight’s local network and local knowledge enables us to meet an individual’s needs in a tailored way which reduces the likelihood of re-offending.